The ninth annual City of Water Day will return to Governors Island on July 16, 10 AM to 4 PM. Those with human-powered boats and kayaks are invited to paddle to the Island; for those without boats free rowing, kayaking, and paddle-boarding will be offered. The highlight of the day is the Cardboard Kayak Race on the water. The event is also held in Hoboken at Maxwell Place Park and neighborhood locations around New York Harbor. The events are sponsored by the Waterfront Alliance, working to revitalize the harbor and waterfront. 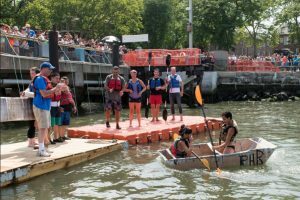 The Waterfront Alliance’s City of Water Day is a free, family-oriented celebration of the world-class potential of the New York and New Jersey waterfront held every July. There will be free boat tours on all kinds of vessels, from fire boats, tall ships, tugboats, and yachts (in 2015, thirty-one free boat tours were available and ferry rides provided 5,270 seats). The waterfront activities fair and children’s activities fair are all-day programming. The waterfront activity fair (in both locations) offers the opportunity to participate in everything from art to science to on-water activities, like kayaking and paddle-boarding. The children’s activity fair—only on Governors Island—is sponsored by Disney and has events such as water-specific games and face-painting. City of Water Day—including boat tours—is held rain or shine! On-water activities will be postponed or suspended only in the case of thunder and lightening. 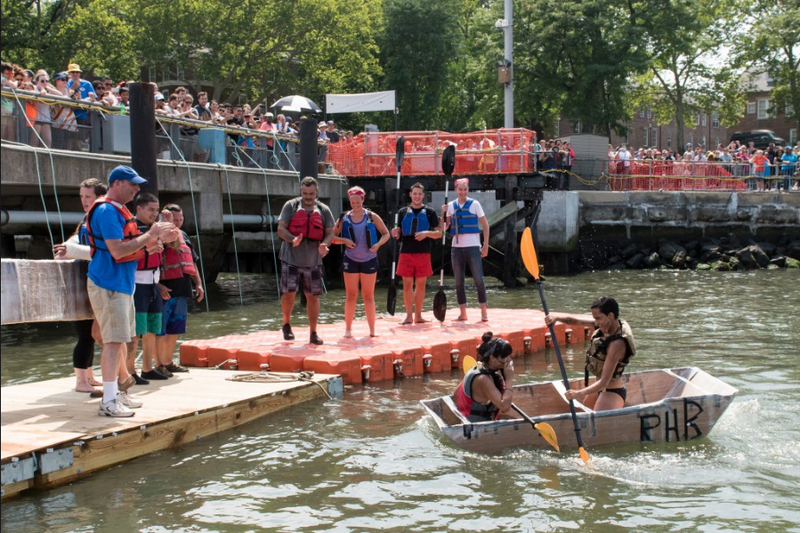 The Con Edison Cardboard Kayak Race will see teams compete to design and build boats from nothing more than cardboard and duct tape, and then get in the harbor for a spirited regatta. Stevens Institute of Technology has claimed the championship for three straight years. Open registration for it will be available soon, as will sign-ups for free boat tours in June. Look for announcements here and follow the #CityofWaterDay hashtag on Twitter.